The frost outside my window this morning is sparkling in the sunlight, but the freezing temperatures have me dreaming of the wide, sparkling beaches and warm sunshine on Coronado Island. I checked the weather on my phone; the high today in Coronado is supposed to be 67°. 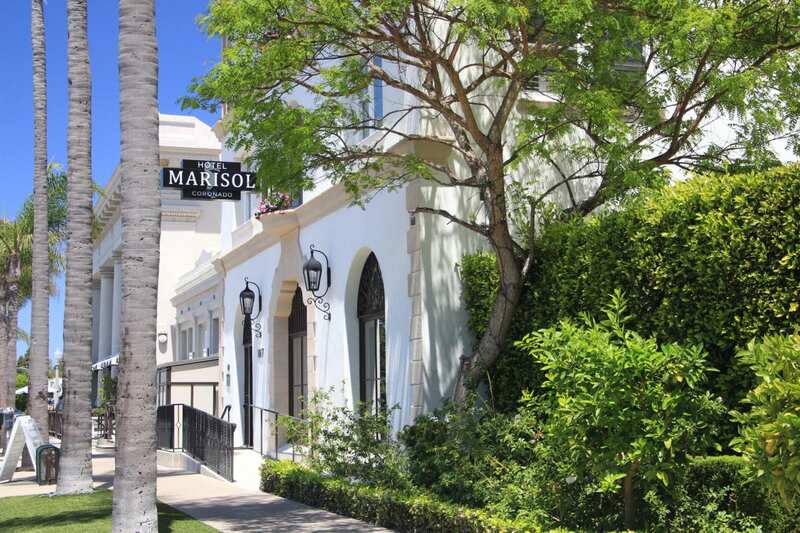 I could walk barefoot on the warm sand with the gentle surf lapping at my feet, take a spin on a bike through leafy, sun-dappled neighborhoods lined with historic mansions, peruse the galleries and shops on Orange Avenue, and enjoy bite alfresco at one of the charming cafes. A flight to San Diego and a quick jaunt across the bay would have me there by the afternoon, but alas, it’s Tuesday, and I have to work. 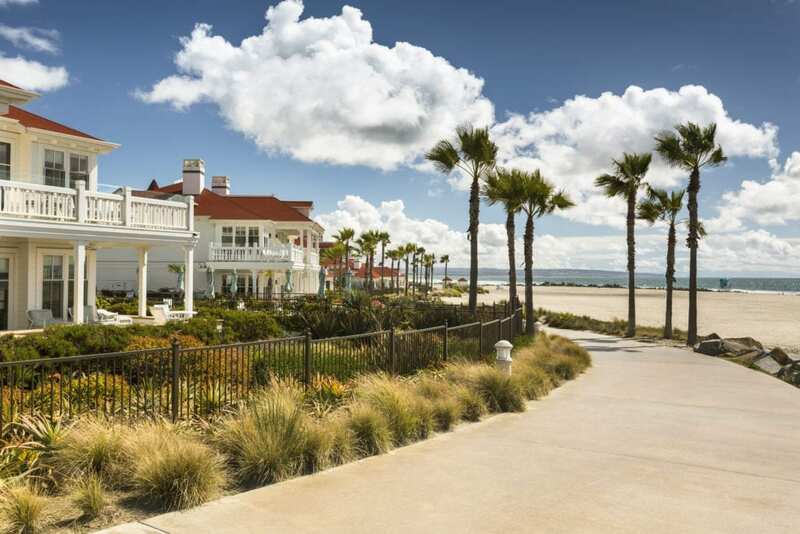 But if you can get away, here are three boutique hotels I’d recommend for a winter escape to Coronado Island. 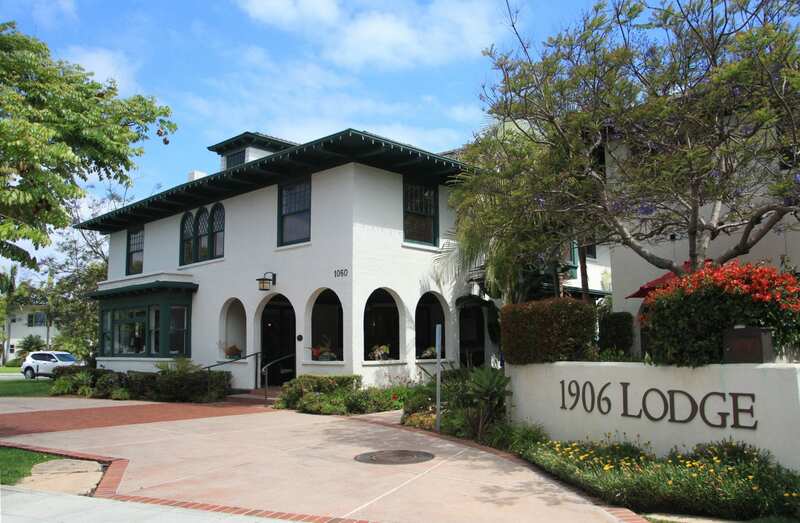 The historic 1906 Lodge at Coronado Beach has been a vacation retreat for over a century. 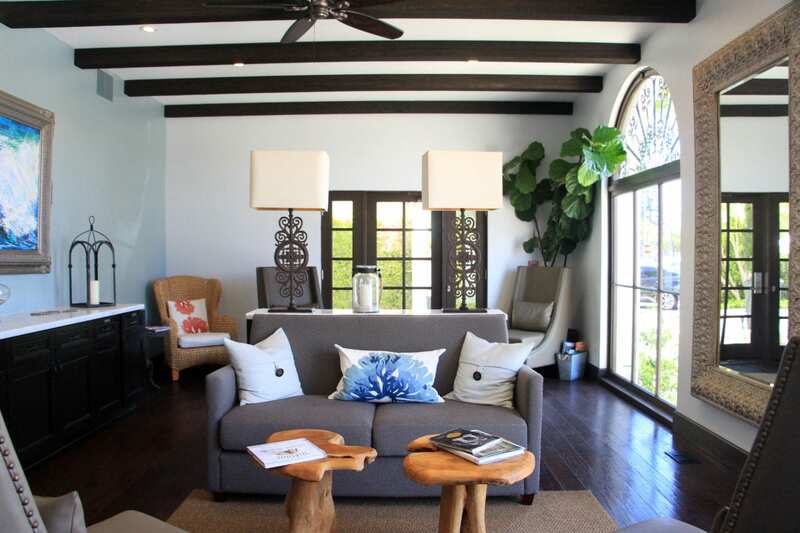 Tucked into a quiet neighborhood just a block from Coronado’s shops and cafes and two blocks from the beach, the lodge exudes tranquility with an understated elegance and upscale coastal vibe. Follow the lush garden pathway filled with the scent of Jasmine into the central courtyard lined with roses and bougainvillea where bubbling fountains cascade into a shallow pool. The private patios of the rooms lining the courtyard and the broad back porch of the main house provides quiet spots to relax with a book and glass of wine. 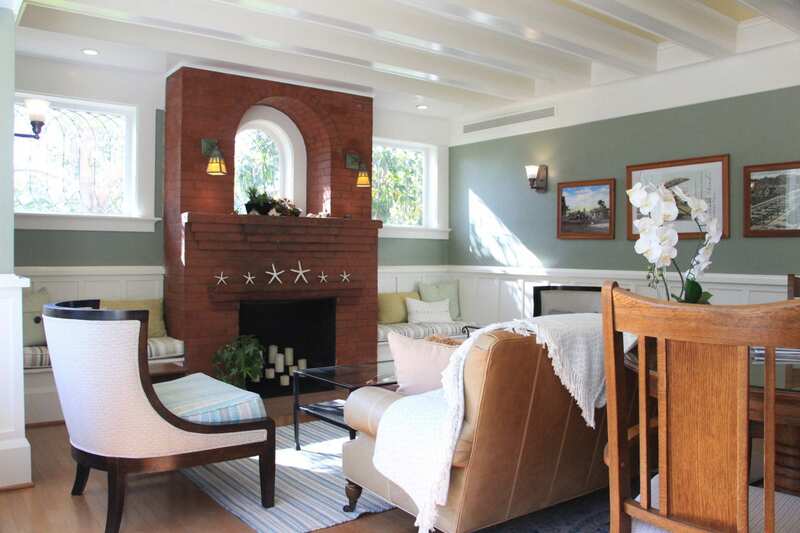 On cooler days, the main house’s airy, light-filled parlor is another charming spot to unwind with its brick fireplace, ornate glass windows, and Arts and Crafts-style. For the ultimate in relaxation, guests can also book massage treatments and facials at the inn’s private, on-site Sanctuary Spa. I stayed in the Star Park room, located in the back corner of the courtyard. 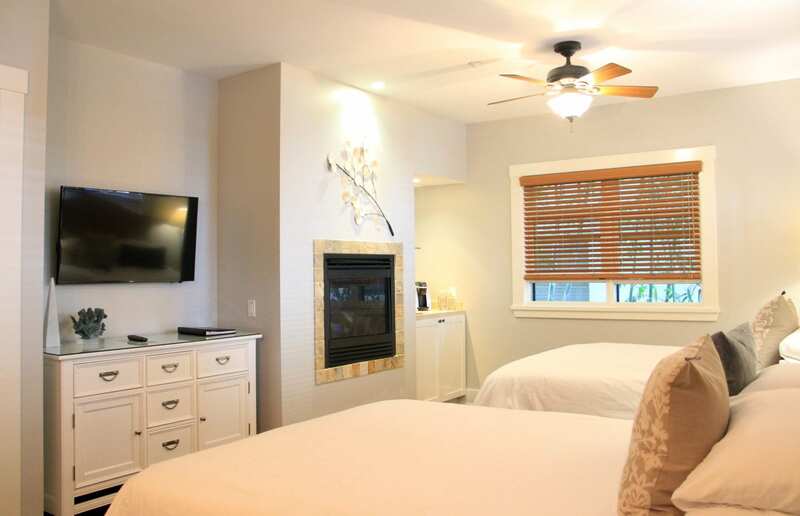 The spacious room featured a double-sided glass fireplace with one side facing a large, two-person jetted spa tub and the other opening to the bedroom. The room also featured a private outdoor patio, a wet bar and refrigerator stocked with complimentary water in chilled glass bottles, and two queen beds covered in luxurious linens. 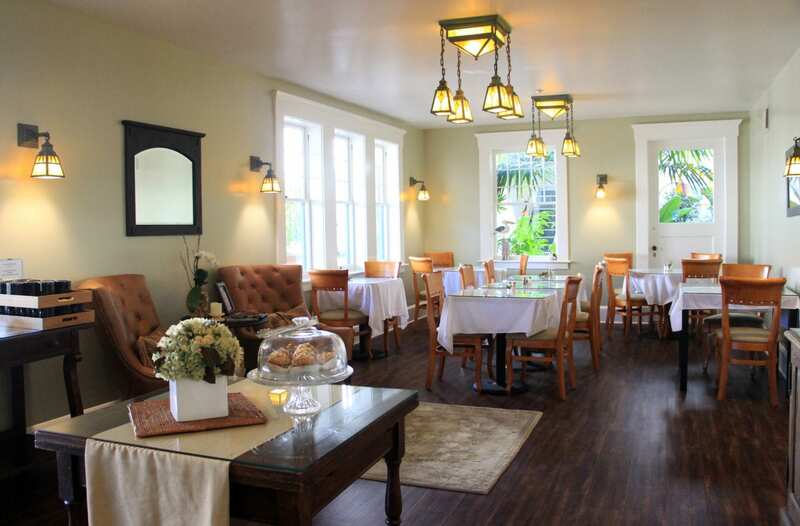 A stay at the inn includes complimentary wine and hors d’oeuvres served each evening, a full breakfast buffet each morning, freshly baked cookies in the afternoon, refreshments throughout the day, and free parking in the inn’s secure, underground garage. The inn also offers complimentary use of its bicycles, beach chairs, beach towels, and umbrellas. 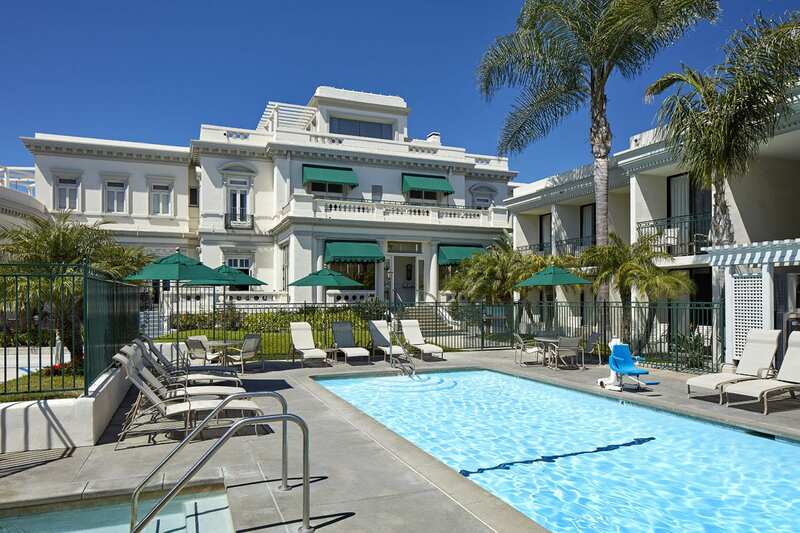 Just around the corner from Coronado’s bustling main street lined with shops and cafes, the Hotel Marisol Coronado is Mediterranean-style boutique hotel with a touch of modern glamour. Originally built in the 1920s, the hotel (formerly known as the Village Inn) was completely renovated by the new owner (inspired by travels in Europe) and reopened in August 2014. 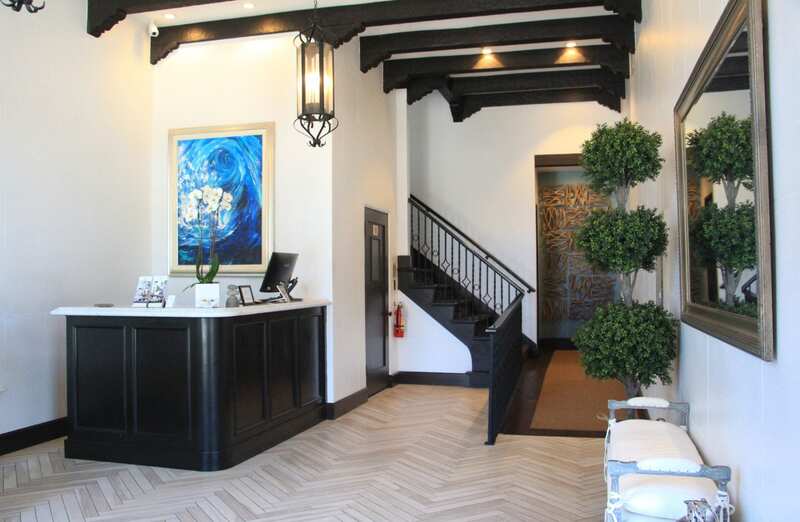 Honoring its original Spanish Eclectic-style architecture, the hotel features smooth white stucco walls, a red-tile roof, high ceilings with exposed wood beams, arched windows with ornate wrought-iron scroll details, wrought-iron light fixtures, and an enchanting courtyard patio strung with lights. A vintage 1920’s Otis elevator serves the hotels’ three floors. A tasteful mix of modern art and photography line the halls. 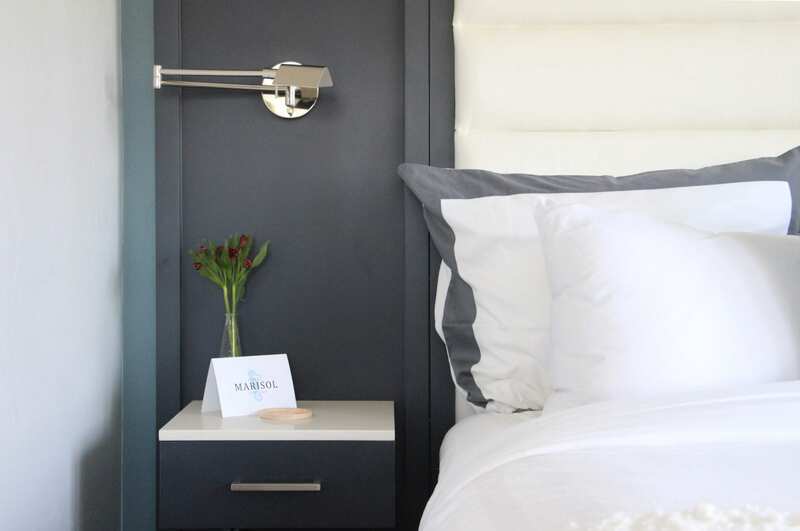 The hotel’s 15 guest rooms have a decidedly modern flair with its sleek furnishings, polished chrome fixtures, and color palettes dominated by white and gray with subtle color accents. The beds are covered in fine Italian linens. The baths, separated from the bedrooms with sliding grid-patterned glass doors, feature marble vanities, white subway-tiled walls, and black and white hexagon-tiled floors. Room amenities include large flat-screen televisions, Keurig coffeemakers, mini refrigerators stocked with complimentary bottled water, and plush robes. 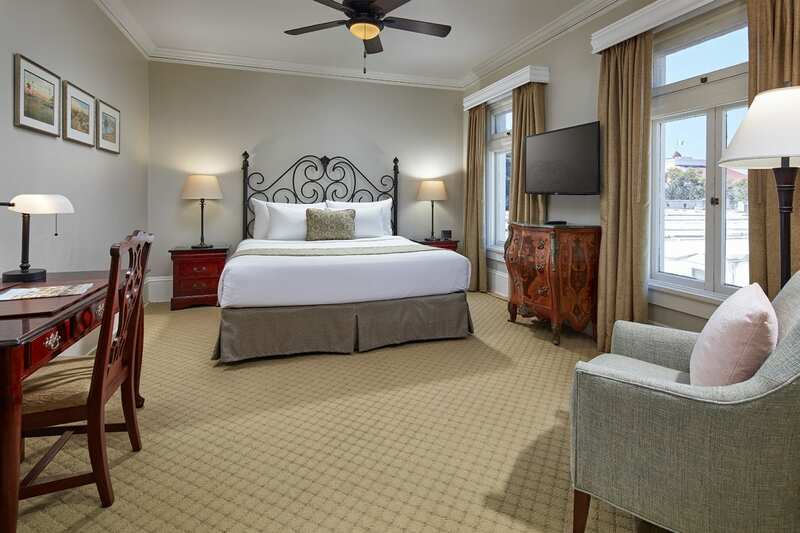 The inn’s four suites feature walk-in showers and Jacuzzi tubs. Guests are welcomed to the hotel with a complimentary glass of champagne or sparkling cider. A continental breakfast is served daily from 7 to 10 a.m. in the parlor. Complimentary bicycles are available to borrow along with beach chairs and beach towels. The glittery sands of Coronado Beach are just two blocks away. 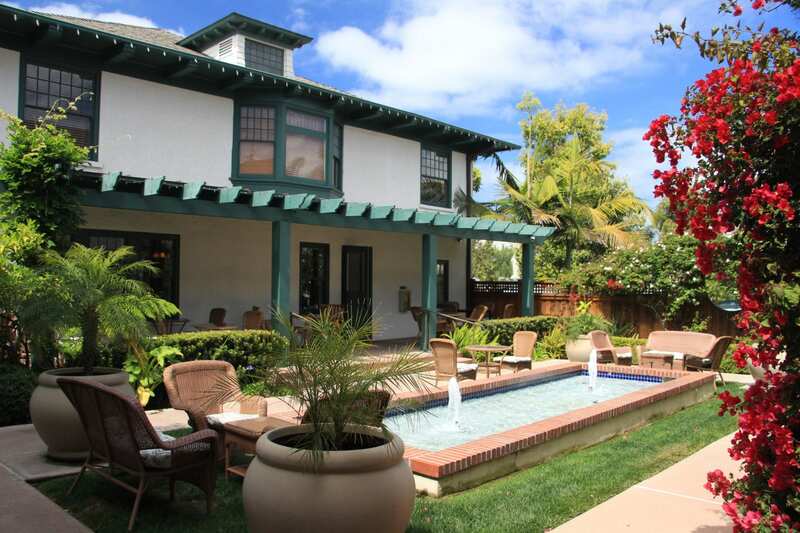 The stately Glorietta Bay Inn was originally built in 1908 as the home of John D. Spreckles, who was one of San Diego’s most prominent investors. The city flourished under his leadership as he invested in the utility company, the water company, the street car system, and established the railroad that helped expand San Diego to the east. But while Spreckles dedicated his energy to building San Diego, his love was Coronado Island. He held controlling interest in the Hotel del Coronado and owned most of the real estate on the island. He contracted with Architect Harrison Albright to build his home on a five-acre parcel directly across the street from the Hotel del Coronado and the Coronado Beach, overlooking Glorietta Bay. 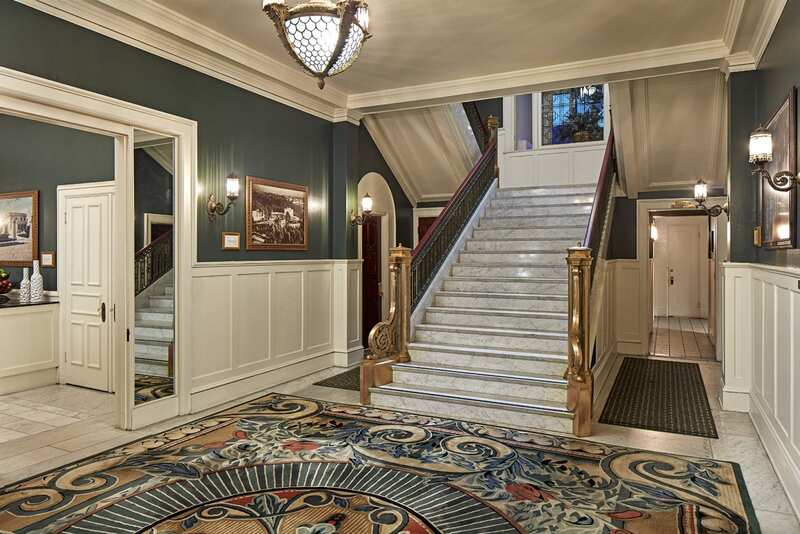 Today, Spreckels’ beautifully restored mansion—with its grand marble staircase, brass cage elevator, skylights, and horseshoe-shaped music room—is the centerpiece of the sprawling Glorietta Bay Inn that includes 11 rooms in the historic mansion and 89 contemporary rooms and suites. 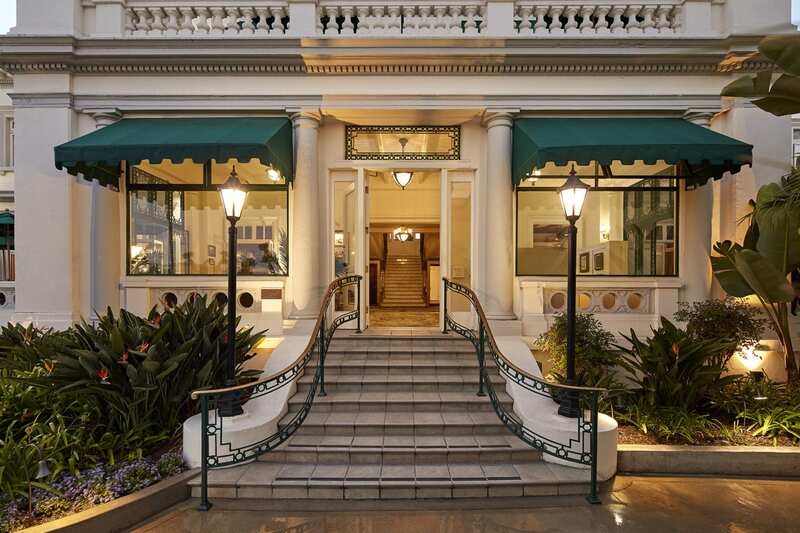 The mansion rooms hold the most appeal for their period architectural details, elegant décor, and unique amenities. 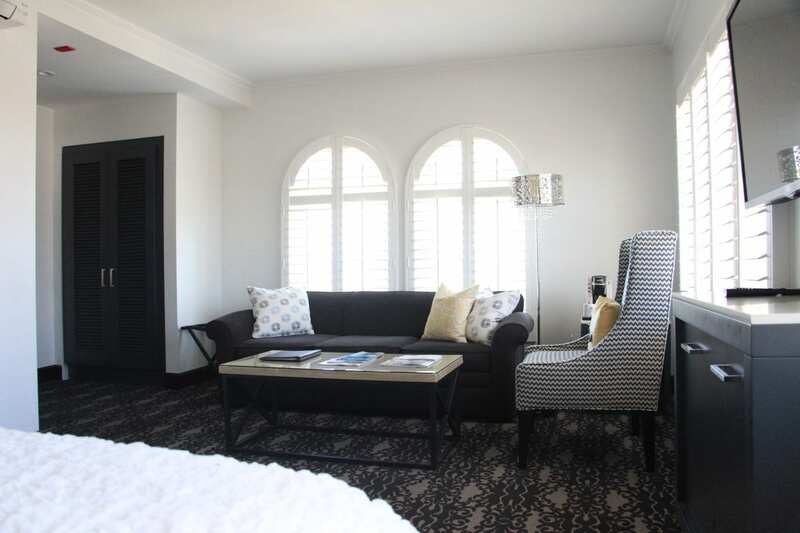 The Spreckles Suite, which was formerly the private bedroom of Spreckels, features French doors that open up to a large, private balcony with a spectacular view of the bay. 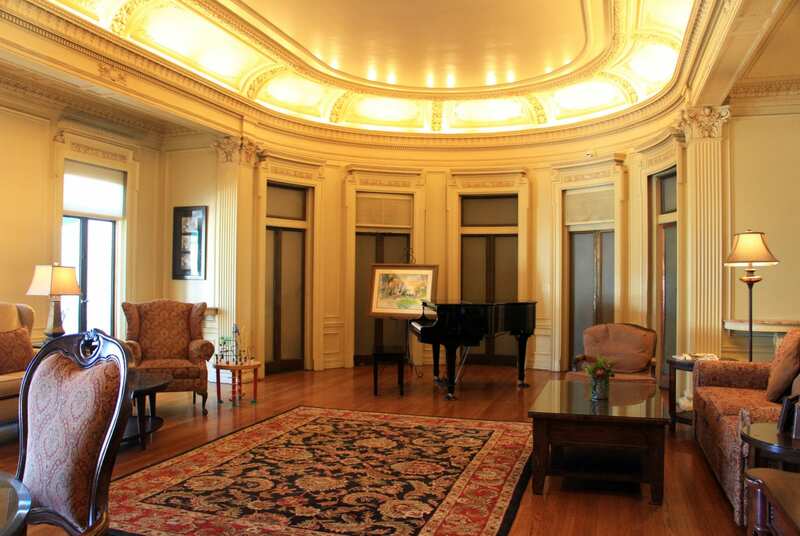 The Crown Room features one of the original skylights. Guests of the mansion rooms are treated to additional perks including turn down service, milk and cookies at bed time, and continental breakfast delivered to their room. The contemporary hotel rooms surrounding the mansion are more basic in their design, but are very comfortable and well-equipped. The inn serves a complimentary continental breakfast each morning, which can be enjoyed on the veranda or in the music room. Their signature gingersnap cookies and lemonade are served each afternoon from 3 p.m. – 5 p.m. Guests can borrow beach chairs, towels, chairs, sand toys to take to the beach. The inn also features a heated outdoor pool and hot tub.